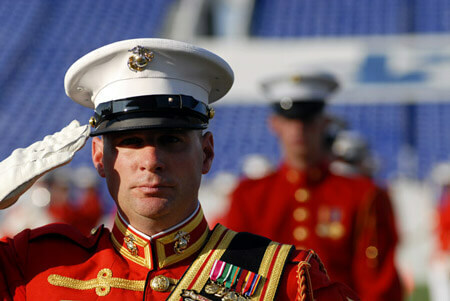 Six corps were in action this Saturday, June 16 at Navy-Marine Corps Memorial Stadium in Annapolis, Md. The DCI Salutes America event was produced as part of MENC: The National Association for Music Education's grand finale to the National Anthem Project. More than 2,000 students joined the United States Marine Drum and Bugle Corps and Drum Corps International performers for a combined ensemble performance of "The Star Spangled Banner." Brass and percussion lines formed an arch stretching across the field as the 2,000 youth singers gathered in front. Opening up large banners, the children created a vast United States flag spanning yard lines as they lifted their voices for a massive salute to America. Check out an action photo gallery from the event.